Homeovet Animal Care ... for quality product and good service. 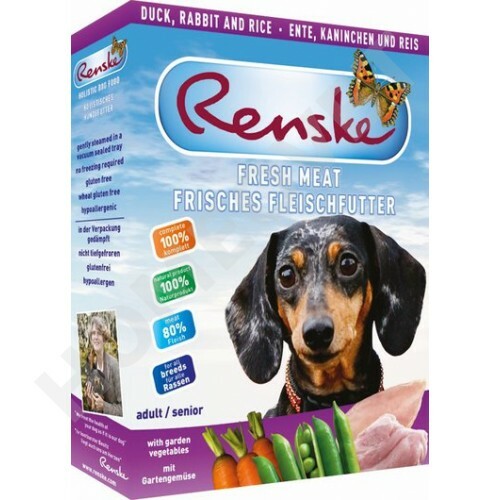 Fresh Meat meal by Renske duck and rabbit complete food for dogs, 80% duck and rabbit, rice and garden vegetables. Extremely suitable for dogs with food allergies. .
Renske fresh meat is composed of a blend of the best ingredients. The key ingredients of this product are fresh duck and rabbit meat (contains no meat by-products!). In addition, the meal also includes whole grain rice and fresh garden vegetables. Renske food is fresh meat-enriched with Scottish salmon oil (for a shiny coat and optimal development of the brain). Glucosamine and Chondrointin to support the joints . In addition, Renske hypoallerginic Fresh Meat meal contains a variety of natural antioxidants to combat free radicals in the body of your dog. Our pure, fresh, natural ingredients are vacuum sealed and gently steamed in the pack to preserve the nutrients. Fresh duck meat (60%), fresh rabbit meat (20%), brown rice (10%), peas, carrots, salmon oil, seaweed extract, herbs, vitamins and minerals, glucosamine, chondroitin. Protein 11.2%, fat 7.8%, ash 3.3%, fiber 0.4%, Moisture 77.3% Vitamin A 2500 IU / kg Vitamin D3 200 IU / kg Vitamin E16 mg / kg (as alpha-tocopherol ) vitamin content guaranteed until expiration date end. Imaverol antimycotic for horses and dogs.